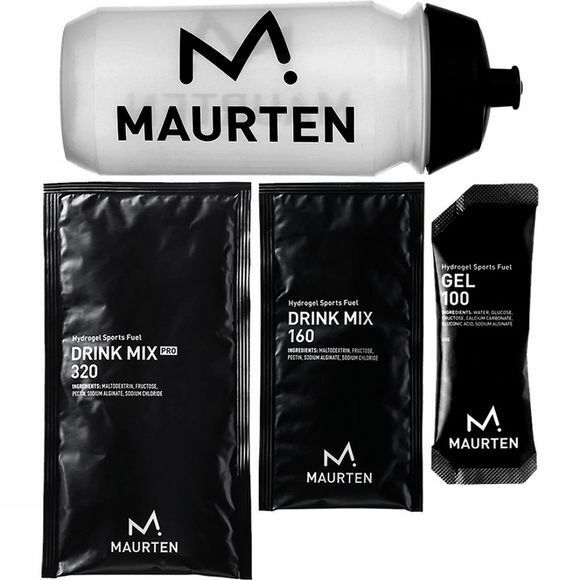 Try out the Maurten Sports Fuel range with this Fuel Pack set containing one Gel 100, one Drink Mix 160, one Drink Mix 320 and one 500ml Maurten Sports Drink Bottle. This set is a great way to decide which of the Maurten products works best for you. The 500ml bottle, which fits standard bottle cages for bikes, is the ideal size for 1 serving of the Drink Mix and contains mixing instructions on the back. The Gel is a biopolymer matrix, filled with a unique blend of fructose and glucose which enables uptakes of up to 100 grams of carbohydrates per hour. A single serving of 40g contains 60% carbohydrates – a high weight to energy ratio. It contains six natural ingredients without any colorants or preservatives. The Drink Mix, one 40g serving and one 80g serving, is built on hydrogel technology that helps to improve carbohydrate absorption. The DM360 is the world's most carbohydrate-rich sports drink, widely used by the best runners in the world. Both the Drink Mix and Gel can be used before, during and after activity.